Competitive Intelligence is fundamentally about making better decisions by taking an externally focussed view that takes into consideration the actions and reactions of our customers, competitors and suppliers. Every company has hierarchy and it is essential for senior management to have a degree control the offers being made in bids. However, it is disruptive when so much effort is spent meeting the internal demands of the organisation, that there is no time to consider the external factors of the competition. Furthermore, several research studies have confirmed that the most successful teams are not simply sat inside their offices considering the external enviornment, they are using that knowledge to go out and actively shape the external competition. This is why Amplio have developed a 1-day introductory course teaching Competitive Intelligence skills. This is a broad course aimed at anyone involved in bidding and complex capture. Competitive Intelligence is not the responsibility of any single person in your organisation. In the most effective companies there are people at all levels who actively gather competitive intelligence, including Capture Leads, Bid Managers, Analysts and Senior Managers. The course is designed to help companies mature along our competitive intelligence maturity roadmap. Most organisations are somewhere between 'Ad Hoc' and 'Monitored' status, whereas the most effective companies use 'Evidence Based' comeptitive intelligence to make better decisions and win more profitable business. 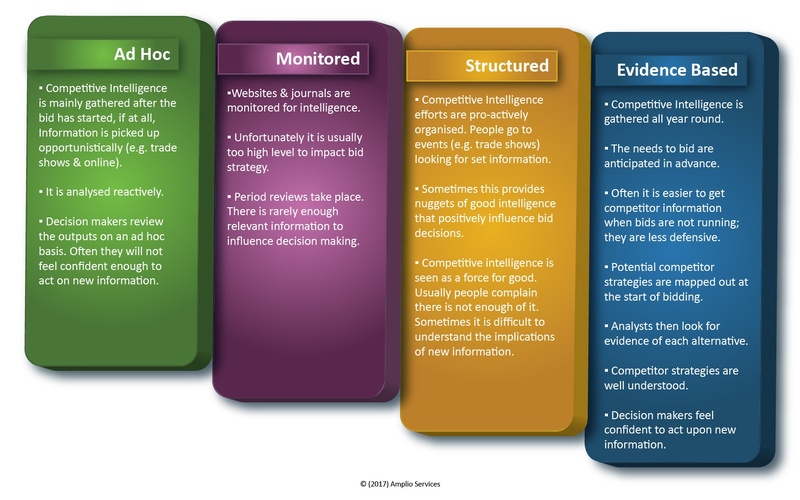 This is a course for people who want a better understanding of Competitive Intelligence. The course is not just for people that want to produce Competitive Intelligence analysis. Please contact us to discuss your requirements and how we can help.